New cover for my upcoming YA romantic ghost story--What do you think? 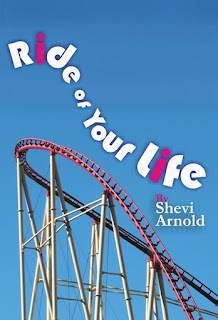 I couldn't open my old cover for Ride of Your Life in CorelDraw, so I ended up recreating it. So what do you think? I changed the font and added some color. This is the next book I'll be indie publishing. It's a romantic YA ghost story about a seventeen-year-old girl who meets the love of her life in an amusement park . . . thirty years after her own death. It was inspired by a real event, The Great Adventure Haunted Castle fire that killed eight young people in 1984. So do you think it works? I have a Facebook friend who wanted to try Twitter but found it too confusing. I completely understand. It can be confusing at first, particularly in the area of "Why do I need this?" For him and anyone like him who would like to start Tweeting but finds it overwhelming, here's the easy guide that should get you tweeting like @NeilHimself in no time. First, the Twitter website is one of the worst ways to use Twitter. It just throws you in and doesn't explain anything. However, I would recommend you start there to set up your avatar and the basic info about yourself. These two things are important, because they let people know you're a real person (it's best if it's a picture or drawing of your face), not some sort of spam bot, and because they give people a reason to follow you back. I usually follow writers or funny people (particularly funny writers) back. I also follow back people who love books. I don't follow back people who want to show me how to lose weight or make $10,000 a month, and I really don't follow back girls with avatars showing them crawling on all fours and making eyes at the camera. I also don't follow back twitter birds or eggs, which are the generic avatars that Twitter comes with. Spammers usually use these, because they want to create and abandon Twitter profiles quickly. As Doctor Seuss almost said, "I do not like green eggs and spam." The two often come together, so you should try to avoid them. You can also upload a nice Twitter background, so that people visiting your Twitter page can see you've put a little effort into it. If you have a digital camera, a nice panorama or a picture of flowers or leaves will do. For a while, I just had a photo I took of one of my bookshelves. I think that's a good way to show my interest in books. Right now, I have a bunch of my illustrations from Toren the Teller's Tale. This might also be a good time to start following some people. You can ask your friends on Facebook (if you're already on Facebook) for their Twitter names and the names of people they recommend following. You can also look up interesting people in your industry. and why someone might want to follow your tweets. Feel free to follow me, @SheviStories: http://twitter.com/shevistories. 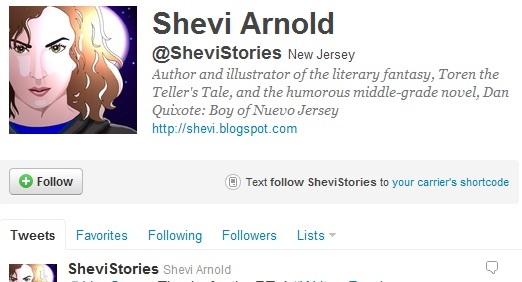 You can also click on the list of people I'm following to see if there are people there you'd like to follow: http://twitter.com/#!/SheviStories/following Feel free to follow whoever you like. While most of the people I follow are writers, illustrators, or people in publishing, you'll find all sorts. For example, I'm a big geek, and I love Mythbusters, so you'll find I'm following AppyGeek and Adam Savage. Pretty soon people will start following you. Just know that it's good manners to follow people back, although you should, obviously, never follow back a spammer. Also, don't expect a celebrity to follow you back. And if you're a writer, don't expect agents to follow you back. They might, but they probably won't. Still, you should follow them if you want to see what they're tweeting about. Look up people you're interested in. I like Neil Gaiman, so I follow @NeilHimself. Editor Elizabeth Law is a lot of fun, so I follow @EgmontGal. And Ellen Hopkins is great, so I follow @EllenHopkinsYA. 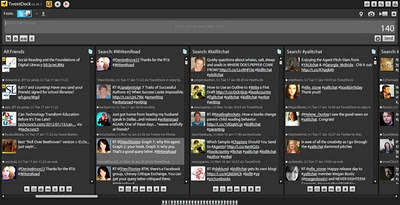 Type in the names of any people you're interested in, and, with any luck, you'll find them on Twitter. Okay, once you're done with that, you can forget about the Twitter.com website, because you won't need to look at it until the next time you want to change your avatar, your information, or your background. 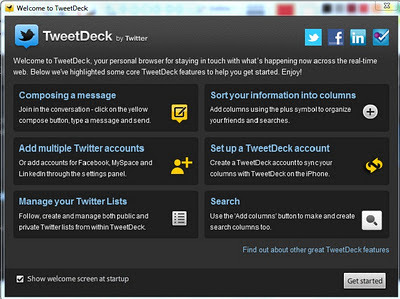 That's because what you will be using--what almost everyone on Twitter uses--is TweetDeck. Go to http://www.TweetDeck.com and click the button marked "Download." 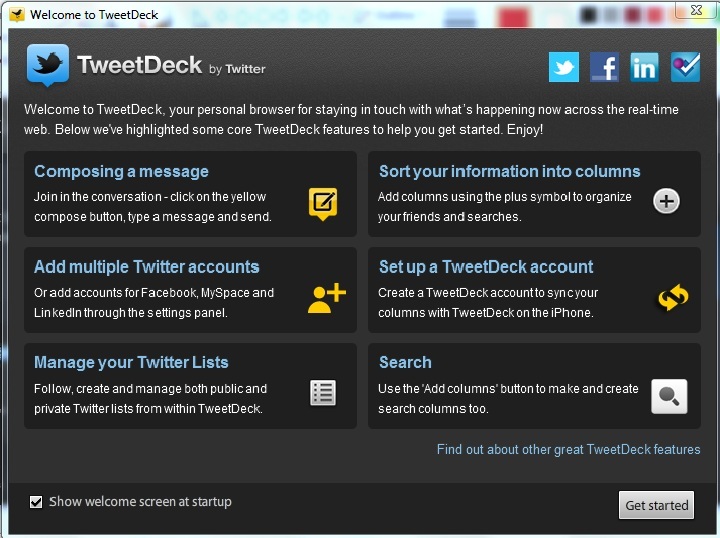 When it comes to Twitter, TweetDeck is your new best friend. Open the TweetDeck app, and everything after that should be clear. See how all the information is there for you to click on? You can find out how to compose a message, add multiple Twitter accounts, manage Twitter lists, sort information into columns, and so on. If you'd rather figure things out yourself, you can just click "Get Started" at the bottom of the window. I've created columns for the various topics I'm interested in. In Twitter, a topic is usually, but not always, a word or group of words with a pound sign in front of it. That's why they're called hashtags, because of that hash mark, #, in front of them. I created columns with the following hashtags, which let me follow conversations of interest to writers: #litchat #amwriting #writegoal #WritersRoad #askagent #YALitChat #KidLitChat. Play around with hashtags to see what people are talking about. For example, do a search for "poet" if you're a poet, and find out if there are hashtags that contain the word "poet" or hashtags poets use. Create columns with the hashtags as the search terms, and read past conversations in those groups. If you'd like to join the next conversation, ask someone from the group if there's a scheduled chat and when the next one will be. Not all groups have scheduled chats, but they are one of the best uses for Twitter. To participate in a chat, make sure to incorporate the group's hashtag in your tweets. Hover your cursor over someone's avatar, and you'll see several options. You can follow the person, reply to the tweet, or forward it. Start a conversation with someone. Don't be shy. A good way to start is by forwarding great tweets and saying how great you think they are. The original tweeter usually appreciates that. Take it slow, have fun, and you should get the hang of it in a week. Oh, and in answer to the "Why do I need this?" question, you don't. It's fun, though, and it's a good way to connect with people, make friends, and stay in the loop when it comes to developments and opportunities in the industry. Have questions for agents, for example? The quickest way to get an answer is by using the #askagent hashtag. Feel good about writing 1,000 words in a day and you want to tell the world? The #amwriting and #writegoal hashtags are good for that. Have questions about writing YA? Try #WritersRoad, #YALitChat or #KidLitChat. You can even include multiple tags on the same tweet, provided you keep it under 140 characters. Twitter is just another way to connect with people who share your interests--all of your interests. I even have columns in TweetDeck for #Eureka, #DoctorWho, #Grimm, and #OnceUponATime because I love these shows, and it's fun to talk to other people who love them too. Oh, and there's one more thing. Blog posts like this often have buttons you can click below them in order to share them with your Facebook friends or Twitter followers. As a blogger, this makes it easier to share information that wouldn't fit into a 140-character tweet on Twitter. As a reader, this gives you an easy way to share helpful posts with other people. It's also a nice way to show your appreciation to whoever wrote that blog post, and most bloggers appreciate the recognition for their work. I know I haven't included everything, not by a long shot, but I do hope it's enough to get you started without seeming too scary. To tweet or not to tweet? I say give it a try! I look forward to reading your tweets. I'm sorry I didn't get a blog post up yesterday. I have a really bad cold. In fact, it's now 4:00 AM, and I've been up since about 3:30 AM, because I can't sleep. I'm coughing too much. It gets worse when I'm lying down. Did you know that driving with a cold is as bad as driving drunk? If that's what it does to your driving, can you imagine what it does to your writing? I'd be careening all over the place! So I think I'm going to stay off the literary roads for a little bit. For Wednesday, I was planning to start a series on how to create a graphic novel. (It's an elective I'm teaching my daughter for her online school.) I'll see if I'm up to it tomorrow, but I might have to delay it a week. Excuse me while I go open another box of tissues. . . . Guess it's a good thing I don't have to go on a book tour with this red nose. (Hey, that's another thing having a cold and being drunk have in common.) I also have a hard time talking, so a book tour right now would be a really bad idea. Anyway, I hope you're well and can enjoy the magic of making stories, or at least reading them. And now I will try once again to get back to sleep. It's been fun. I received a couple of glowing reviews, made some fans, and enjoyed being interviewed. I also discovered some interesting book blogs I wouldn't have discovered otherwise. 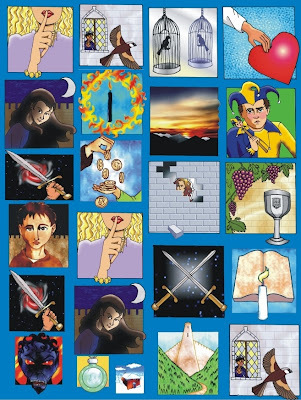 Meanwhile, I've been hard at work getting the paperback version of Toren the Teller's Tale ready for publication. I can't believe that I just need to receive and approve the proof, and then the book will be available through all outlets. This is so exciting! January will be Marketing Month for Toren and me. I'm interested in swapping blog posts, doing author interviews, and so on. If you would like a blog post or an interview from me, let me know. We could do an exchange. Any other ideas? Should I do YouTube videos? Contests? What do you like to see on an author's blog?